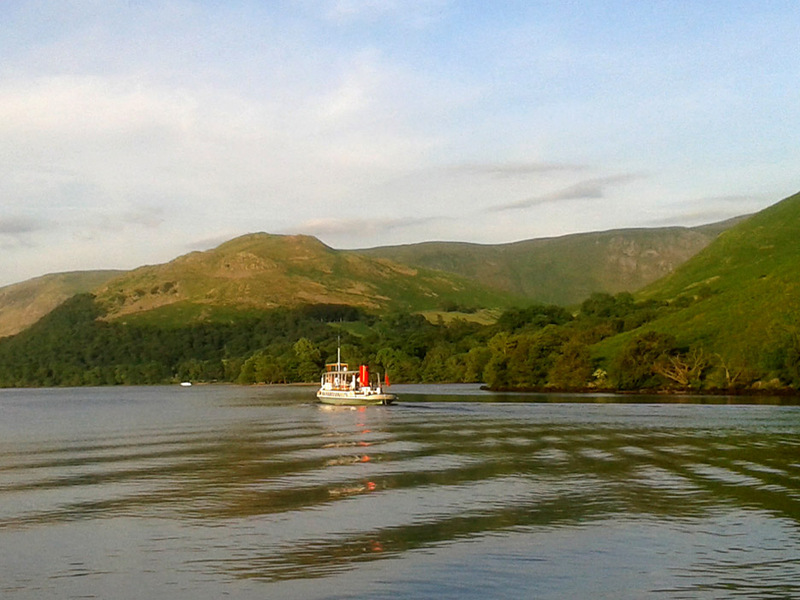 " Fisher's Ullswater Trip "
Date & start time: Tuesday 9th July 2013, 7 pm start. 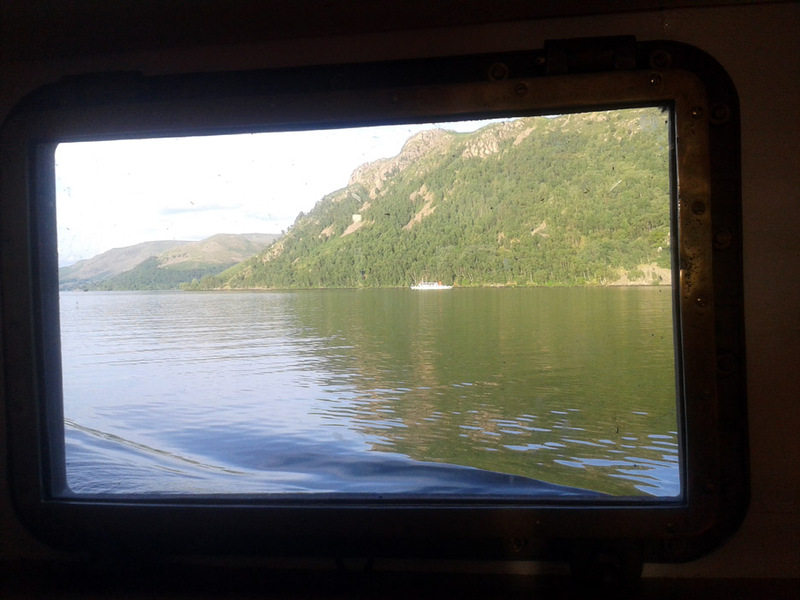 Places visited : Pooley Bridge, Kailpot Crags, Aira Point and back. Walk details : 12 mls, zero feet of ascent, 2 hours including supper. Highest point : The summer ambience ! Walked with : Ann and myself, twenty other Fishers Staff and about thirty other folk. Weather : Sunshine and blue skies, very warm. July is here and so is the summer weather . . . we're not used to this ! It is a hot evening with cloudless skies and excellent views . 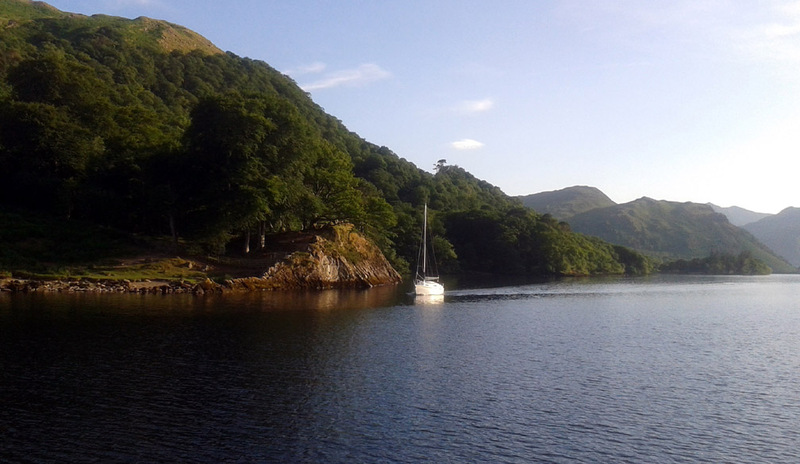 . . and it coincides with a boat trip on Ullswater . . . even more unbelievable ! 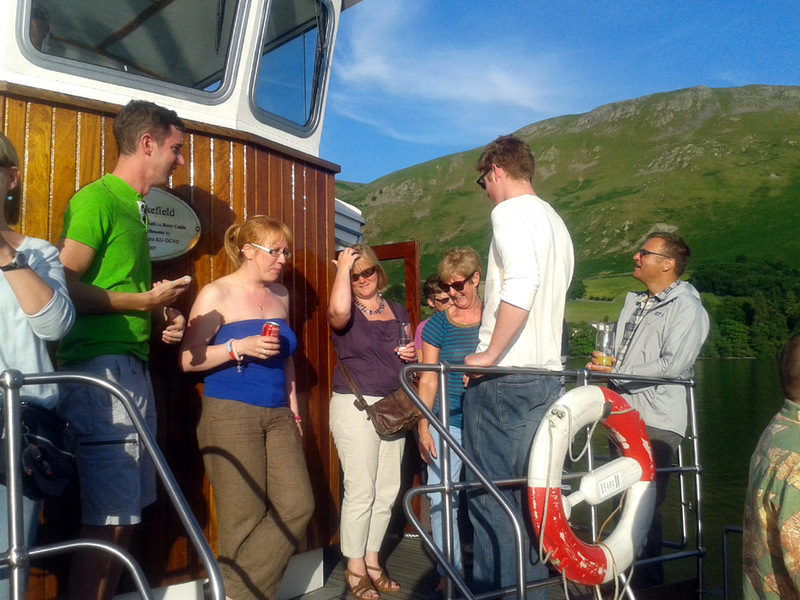 This evening we are cruising on the Ullswater Steamer with a group of colleagues from George Fisher. 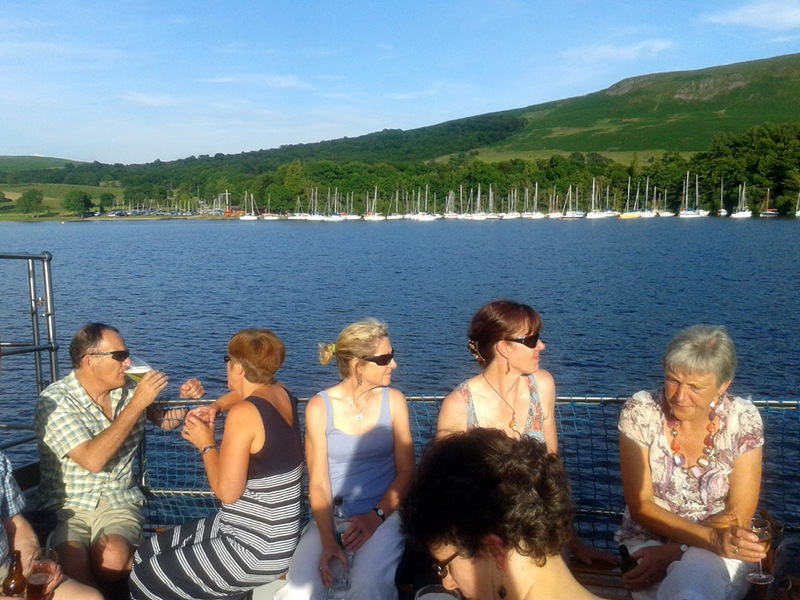 Welcome aboard our "Summer do". 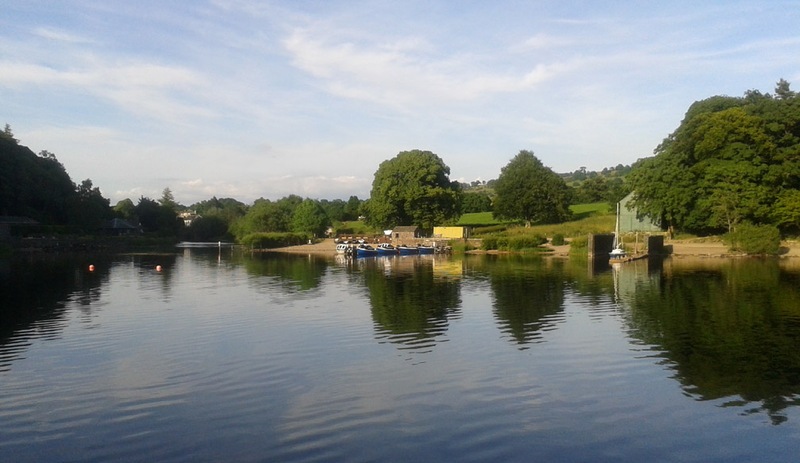 Starting point and ending point at the Pooley Bridge Pier. Our boat, the Lady Wakefield awaits . . . the bike . . . don't worry about it, it is only Paul's new motor ! Flat calm at the lakeside, where the lake narrows to become the River Eamont. 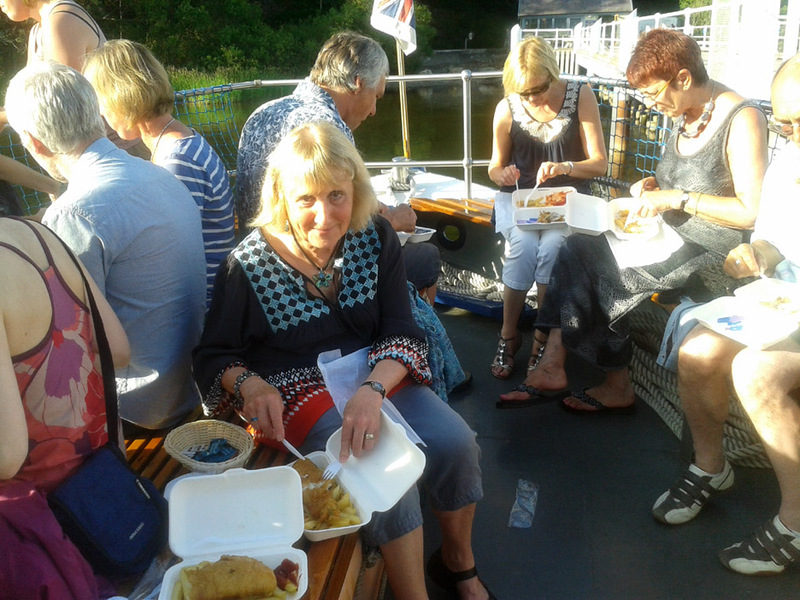 The cruise included a fish and chip supper which was served hot and fresh at the start of our trip. 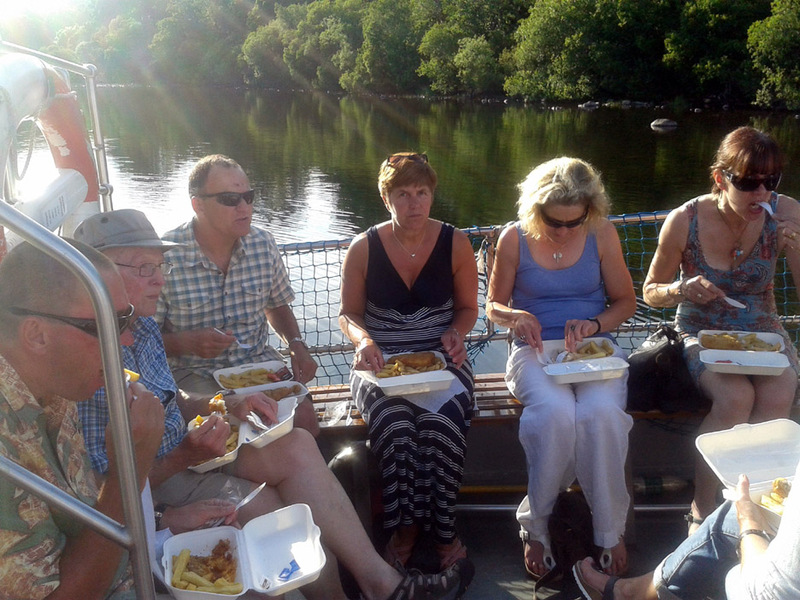 Concentration and silence all round as we enjoy our simple meal. As the last of the containers were cleared away, and with a refreshing beverage in hand, it was time to start our cruise. 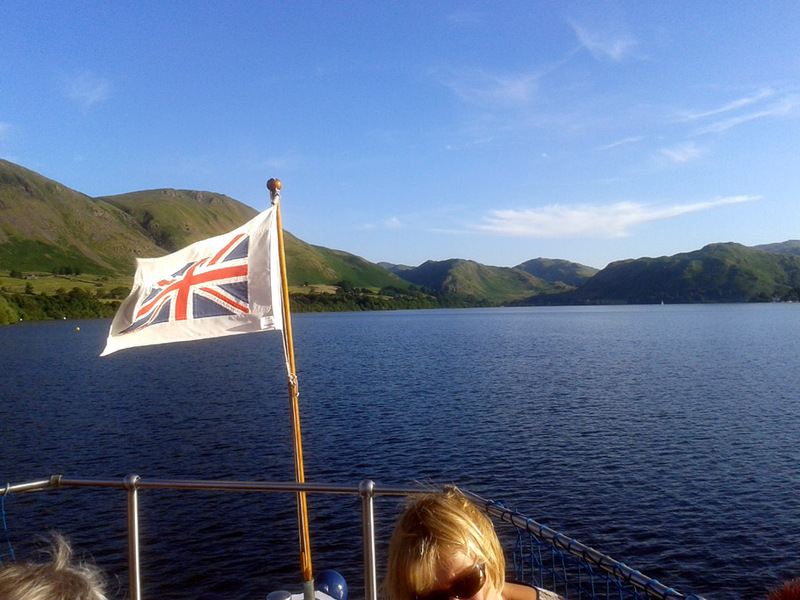 Hardly a ripple, the flag blowing purely from the forward motion of the boat. A beautiful balance of warm air and a cooling breeze. The fells have that rich summer green as the trees are in full leaf. Unfortunately the bracken is in full leaf too which cloaks some of the slopes above the tree line. Into the sun as we head on down past Oldchurch Bay. Colleagues who tonight who shall remain nameless to protect the guilty ! A big thank you here to Pete Lashley who provided a musical accompaniment to the evening in the main cabin. 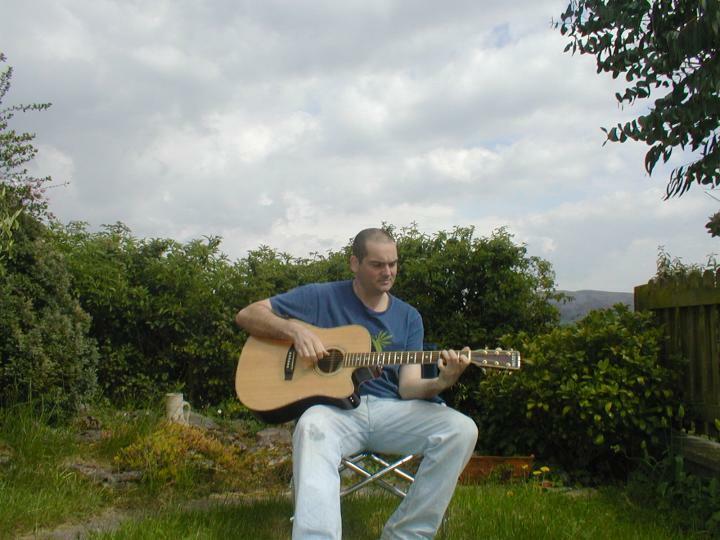 He played a selection of traditional folk and self-penned songs, liberally washed down with a few fine Beatles tracks. 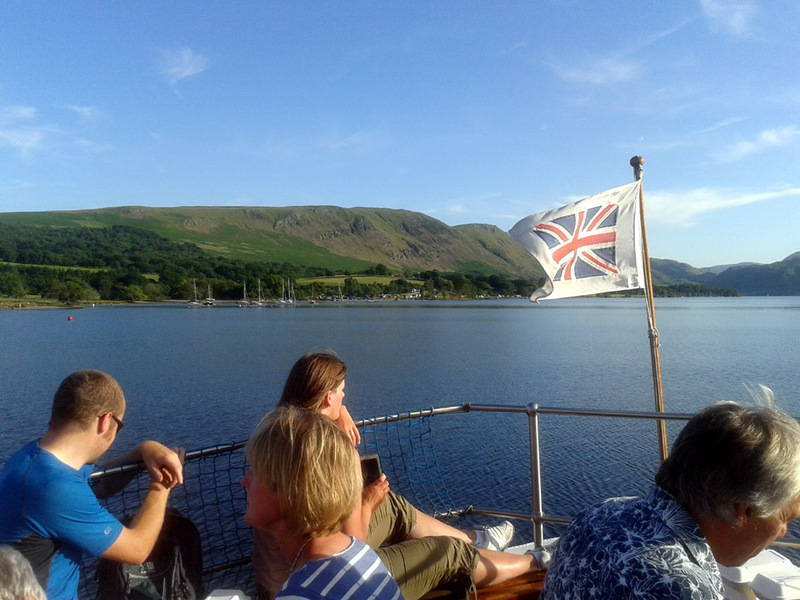 A very pleasant and cheerful sound, if slightly in the background tonight, as we spent most of our time out on deck ! 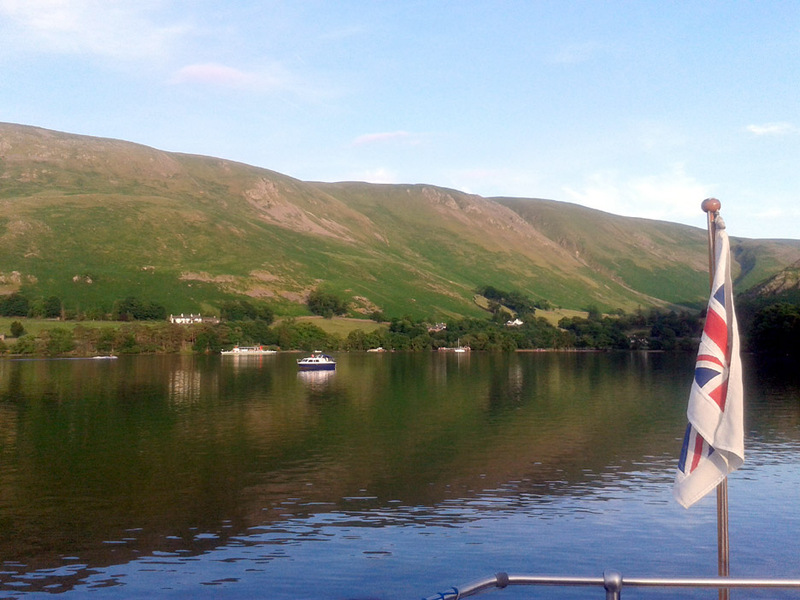 Onward past Howtown, passing the lakeside Kailpot Crag. 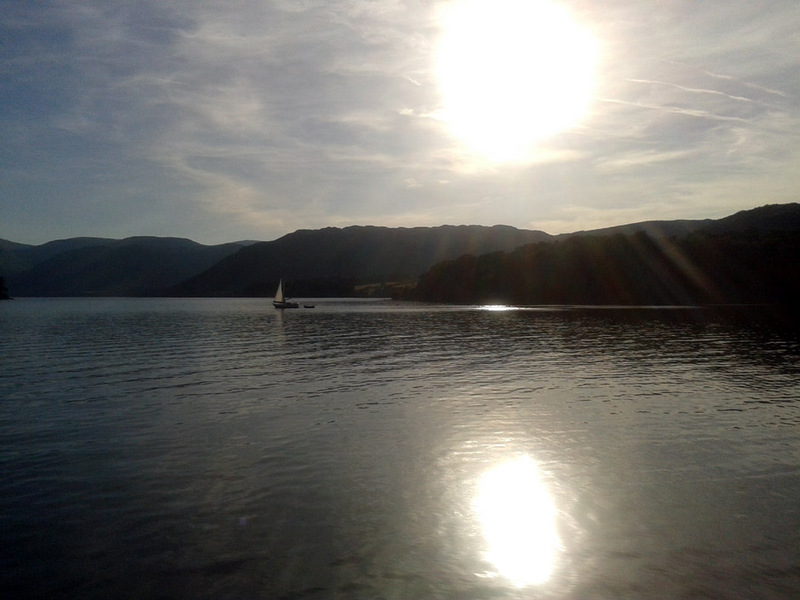 who was a leading campaigner against turning Ullswater into a reservoir and so protected the lake we so enjoy today. 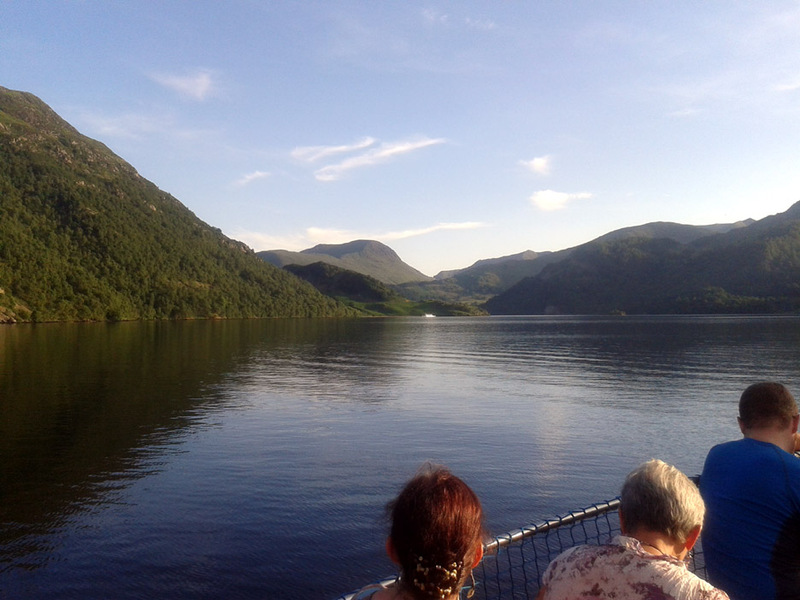 Looking down the lake to the triangular summit of Catstycam, to Helvellyn, Dollywagon and Nethermost Pike. 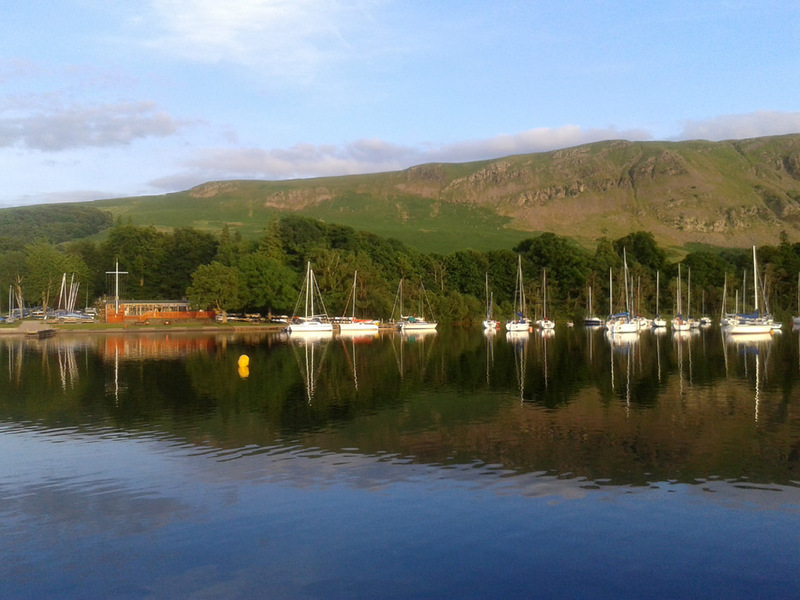 The large rounded fell is St Sunday Crag . 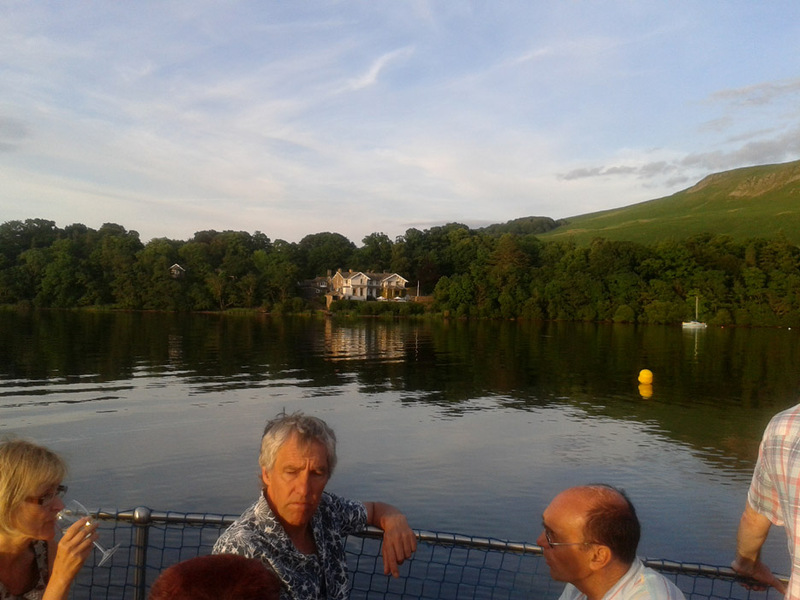 . . they all look slightly different when viewed from the water. The trip tonight is not a scheduled lake cruise so we have not called at any stops on our way up the lake. Below deck we can see the sister boat, The Raven, making its way in the opposite direction. Half way point and we turn to follow her back towards Pooley Bridge. 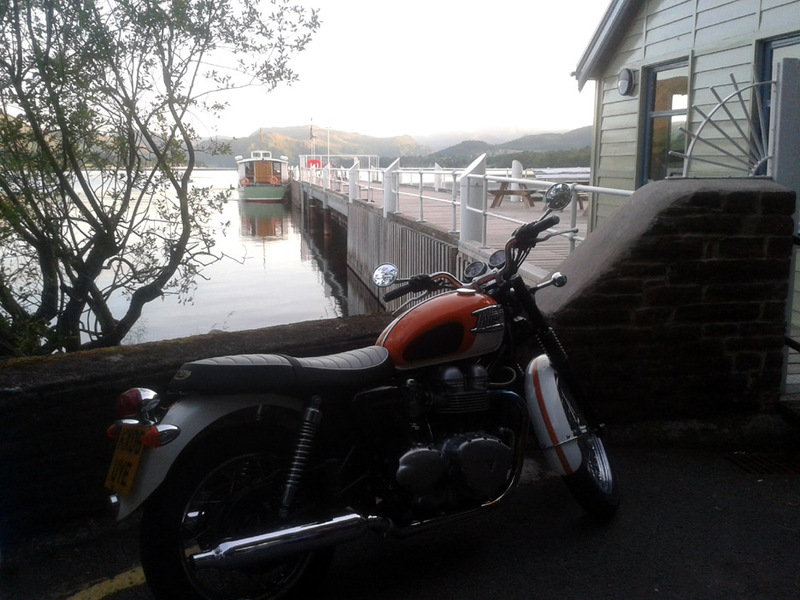 You may recognise Hallin Fell behind her. 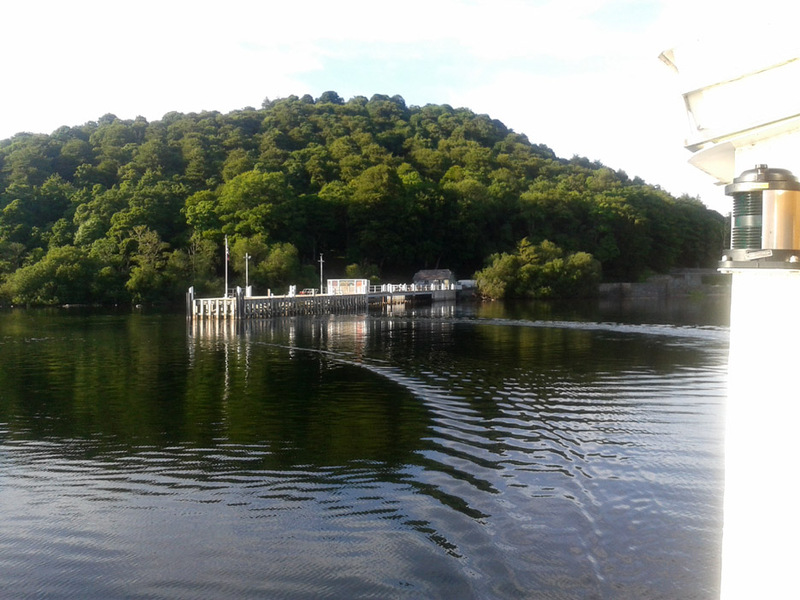 We sail into Howtown Bay . . . but unlike The Raven we do not call at the jetty. Passing the yacht club once again . . . the lake even calmer than before. Not a good evening for a sail as there's no no breeze at all now. 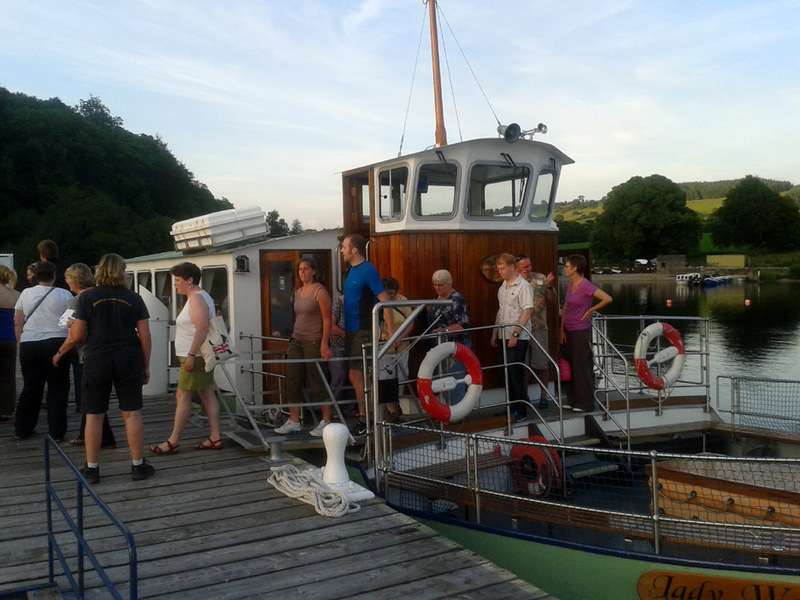 Disembarkation back at Pooley Bridge after our evening cruise. Back to work tomorrow !
. 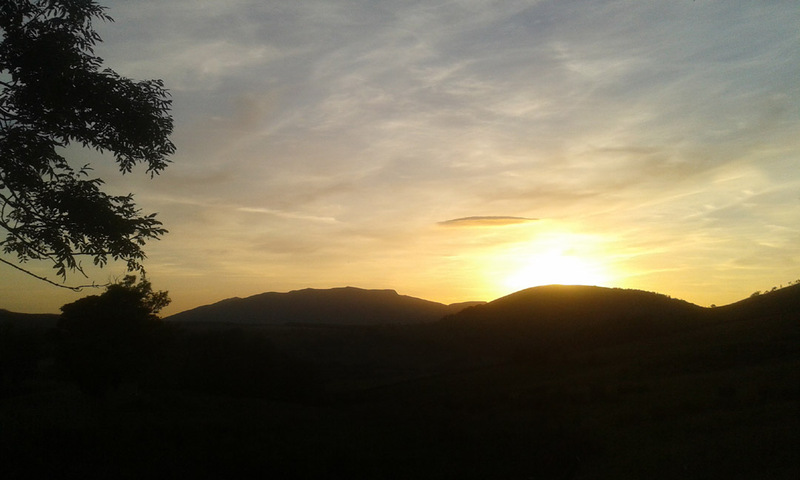 . . but not before we catch a delightful evening sunset over the skyline of Blencathra on the way home. Technical note: All pictures (except one) taken with my Samsung mobile phone no less ! This site best viewed with . . . a "Ticket to Ride"